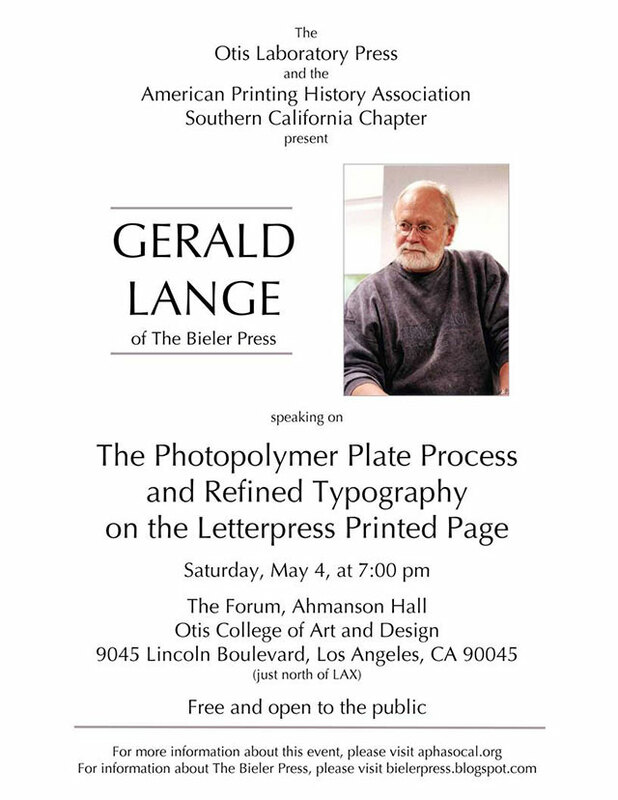 Gerald Lange is the proprietor and founder (1975) of The Bieler Press, a small printing and publishing firm specializing in studio letterpress, typographic design, and the publication of finely-printed limited edition books and related matter. Lange teaches at Otis College of Art and Design. He’s written numerous essays and articles on typography and the book arts which have appeared in Parenthesis (FPBA), book art object (CODEX), Ampersand (PCBA), Printing History(APHA), Guild of Book Workers Newsletter, Counter, Serif, Bookways, and The Typographe. Now in its fifth edition, Lange’s monograph Printing Digital Type on the Hand-operated Flatbed Cylinder Press was first published in 1998. In 2001, he founded PPLetterpress <http://groups.yahoo.com/group/PPLetterpress> , an online forum on investigative, exploratory, and alternative printing and typographic techniques.